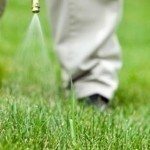 My husband sprayed all of my flowers and shrubs with weed killer. The plants all have yellowing leaves and the flowers on all hibiscus are dried and rotten. It happened during the past two weeks. Can I save these plants or should I dig them up and just start over? This is but one type of flower. All of them have yellowing leaves, these - the hibiscus - were the only ones still blooming. The leaves have holes like insects. I live in Norfolk VA 23503 My heart is shattered.